Whether you’re in the office, on the factory floor or offsite, you can connect via this cloud-based solution, with your teams & complete your assigned tasks easier & faster using your smart device of choice. No hardcopy forms to complete, scan or send via email all in real-time. 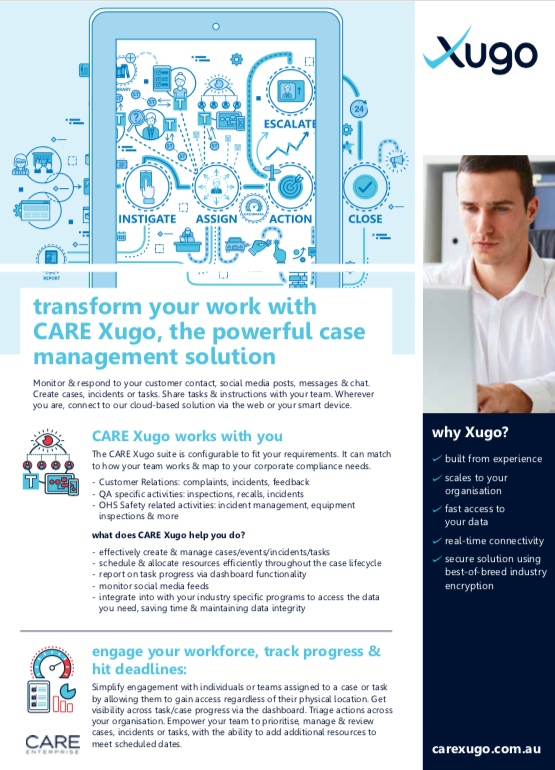 it works with you to effectively create & manage cases; schedule & allocate resources throughout the case lifecycle; manage risk, issue & compliance management; efficiently schedule & allocate resources throughout the case lifecycle; view critical tasks; approve & complete tasks, create sub-tasks; & report on tasks & dashboard functionality. case activity updating in your business systems. Xugo drives your actions via rule-based workflow routing of cases to your teams no matter what their location. how you’re doing at specific tasks. logged & saved for easy traceability. Optimise the exchange of information within your organisation & with suppliers. Xugo has been built as open & flexible as possible, & can be readily integrated with your existing business systems. For our existing CARE clients – Xugo seamlessly connects with your existing CARE tasks & updates task activity back into CARE. Whether you’re in the office, on the factory floor or offsite, you can connect with your teams & complete your assigned tasks easier & faster using your smart device. No hardcopy forms to complete, scan or send via email. it works with you to effectively create & manage tasks; schedule & allocate resources throughout the task lifecycle; manage risk, issue & compliance management; efficiently schedule & allocate resources throughout the task lifecycle; view critical tasks; approve & complete tasks, create sub-tasks; & report on tasks & dashboard functionality. Connect your business in real-time with your task activity updating in your business systems. Xugo drives your actions via rule-based workflow routing of tasks to your teams no matter what their location. Complete forms/checklists, with the power to respond to a case by creating a new task &/or sub-tasks to assign to other users or teams in the business. task activity updating in your business systems. with your existing business systems. Xugo has broad application for consumer affairs, quality control, compliance & sales. We’ve been delivering compliance solutions for over 25 years, so with that experience we’ve made sure that Xugo can – initiate cases, complete quality forms / checklists, root cause analysis & more. create forms & checklists for your business to complete, all from your device wherever you are. Manage & track consumer feedback or case investigation actions following workflows powered by your corporate compliance, policies & procedures – what needs to be done, how, by who & by when. Remove the manual exchange of forms & spreadsheets. Reclaim & focus your team’s time, increase accuracy of data through review & approval of tasks. Better understand your consumers via the Social Media Monitoring tool & transform your customer service experience with the webchat functionality. Include unlimited users, teams, dept.’s to support your processes, empower your staff to get answers, complete tasks & together resolve cases. 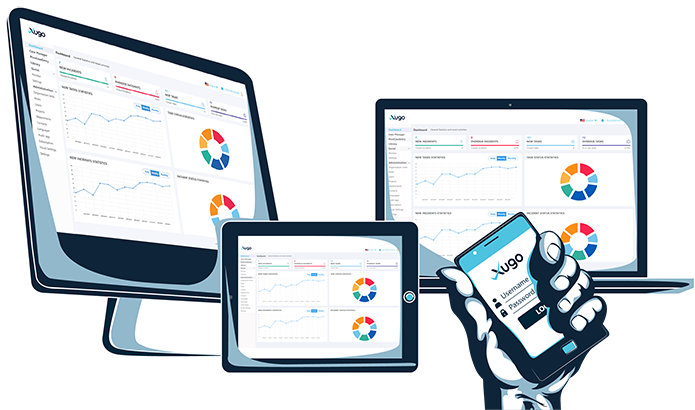 Xugo’s interactive dashboard shows data in real time, where you can review your workload – tasks, cases & or actions. Resulting in increased accountability & insight to your business processes. Include unlimited users, teams, dept’s to support your processes, empower your staff to get answers, complete tasks & together resolve cases. Resulting in increased accountability & insight to your business processes.